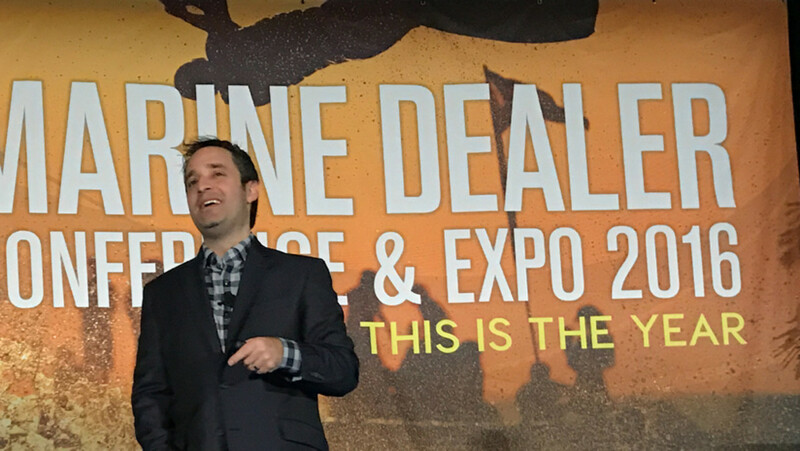 The Marine Dealer Conference & Expo’s first keynote speaker, Josh Linkner, told industry professionals Tuesday to "let innovation carry the day." 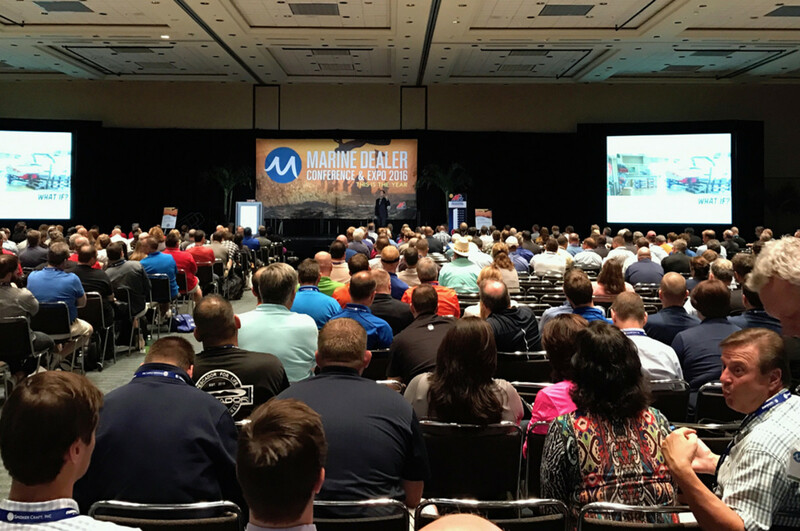 ORLANDO, Fla. — A record number of marine dealer professionals are attending the 2016 Marine Dealer Conference & Expo this week at the Orange County Convention Center, which boasts a program packed with more educational and networking opportunities than ever before, organizers say. There were 658 pre-registered attendees as of today. "Walk-in attendees continue to impact registration numbers," Walz said. The previous dealer attendance record was 617 in 2013, she said. The MDCE, which began Monday and wraps up on Thursday, is the premier education and networking event for boating retailers and is the only one developed by dealers for dealers. The feedback allows organizers to improve the show. This year the event features new “Dealer-to-Dealer Roundtable Discussions,” which consist of 30 meetings on topics that include inventory management, website design and handling difficult customers. Also new this year are the Dealer Case Studies — insights into best dealer practices that are already in use and that other marine businesses easily can adopt. The Innovation Spotlight, a series of 15-minute educational presentations on trends in marine products and services, is also new. 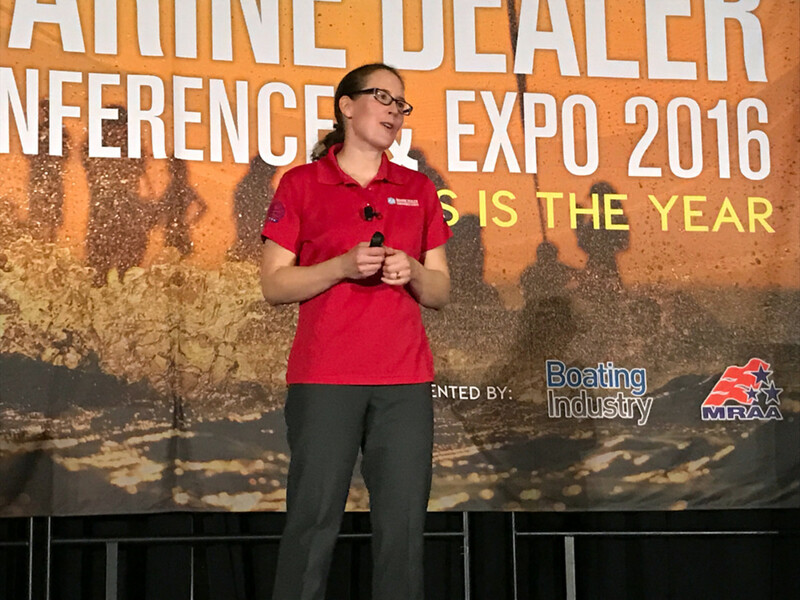 Marine Retailers Association of the Americas vice president and director of education Liz Walz said the key to the event&apos;s success has been acting on attendee feedback to make improvements each year. The core of the event consists of 11 pre-conference workshops, four educational tracks (leadership, sales, marketing and service) and keynote presentations. For the first time, there will be three keynote speakers. His 90-minute presentation Tuesday afternoon — “The Gravity-defying Leader: Innovative Approaches to Hyper-growth Leadership” — was packed with examples of well-known business leaders and everyday people finding success by taking chances on innovation in unconventional ways. Linkner, whose father owned a 38-foot Island Packet sailboat, told the audience about the five “obsessions” that drive innovative thinkers — Get Curious; Crave What’s Next; Defy Tradition; Get Scrappy; and Adapt Fast. To illustrate the Get Scrappy principle, Linkner, who grew up in the Great Lakes region, used the example of a bicycle company that began using shipping boxes labeled as “plasma televisions” so carriers would use extra care during transport. This led to a sharp decrease in warranty claims. “The key to innovation is grit,” said Linkner. To show how successful people are capable of adapting fast, Linkner ran a video of Kevin Bull, a young stockbroker who was successful on the TV show “American Ninja Warrior” by using his legs instead of his upper body to complete an acrobatic feat that had not previously been accomplished on the show. Linkner called Bull’s move “a Reversal,” an unconventional idea that leads to innovative achievement. He also told the story of a Pittsburgh hospital that used window washers dressed as superheroes to cheer up sick children as they squeegeed their way down the building. It was clear that Linkner did his homework and knew his audience. He tried to get the crowd’s creative juices flowing with examples of innovative and cutting-edge marine products and boats, such as a solar-driven yacht (Solaris by Duffy London), an underwater drone-like device that cleans the bottom of a boat (Keelcrab) and an app (Dockwa) that carries out dockage and dining reservations for cruising boaters. He also had the audience carry out a few exercises, including brainstorming on ways to increase revenue by 30 percent in one year. “I grew up around boats, and throughout my short lifetime there have been so many changes,” Linkner told a crowd of about 600 at the convention center. The MDCE is organized and managed by the Marine Retailers Association of the Americas and Boating Industry magazine.